Locating a well-bred, well-socialized, happy and healthy Wheaten puppy is not something that happens overnight. There is far greater demand than there is a supply of puppies each year. If there are 20 breeders within the Delaware Valley area and they are breeding just one litter per year, with an average litter size of 5, there is the chance that maybe 100 puppies are born in any given year, that is, if every breeding results in puppies. Next compare this number (5 puppies that may need homes) to the volume of telephone/e-mail inquiries each breeder receives. In reality this number can be as many as 15 inquiries or more every week all year long…for that one litter of 5 puppies. Clearly, breeders receive hundreds more calls and e-mails than they have puppies to place. Now, here’s the good news. To live with a Wheaten you must develop a great deal of patience because these are intelligent dogs who retain their puppy-like qualities well into their senior years. They do not respond to harsh treatment and often times are smarter than their owners. Because of this, patience is truly a virtue! 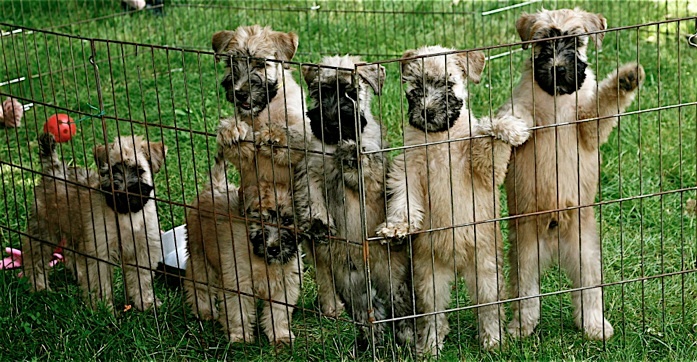 While searching for a Wheaten puppy you can put this highly desirable trait (patience) to use. If you become frustrated because you’ve called everyone on the list, and no breeder has a puppy available today — and you just have to have one now — this is not the breed for you. The acquisition of a new family member should be a well thought out decision. Wheaten breeders feel your frustration. We would love to have a puppy available for every great home that contacts us. Unfortunately our answer can be, “Sorry I have nothing available.” When a breeder tells you this, use this phone call as an opportunity to learn more about Wheatens to see if this is truly the breed for you. Also ask them if they know of someone else who might have a litter or planning on doing a breeding. If you are bound and determined to have a Wheaten then you need to cultivate relationships with reputable hobby breeders and be willing to wait. Realize that the wait may be as long as two years. Attend dog shows in your area and seek out Wheaten breeders. Be willing to travel to do so and be willing to visit breeders, even if they have no pups at the moment, so that you can meet the breeder, they can spend time with you and you can meet their dogs. Each potential Wheaten owner needs to see what the breed is like at different stages of their development. Everyone falls in love with a Wheaten puppy but all puppies mature and you need to make sure that the exuberance of a 1 year old or 4 year old and even 7 year old is something that you can live with. If you have decided that a Wheaten is the breed for you because you or someone in your house has allergies, think again. While Wheatens do not shed, they are still dogs and have dander. Non- shedding dogs require extensive coat care, i.e., grooming. This means daily brushing which is a time commitment that not everyone has to offer. Part of the beauty of the Wheaten is their coat and if you don’t have the time to devote 20 minutes daily to coat care, then maybe another breed would be in your best interest. Because a puppy is not the best option for every household you may want to consider a retired Wheaten Champion or a younger dog that a breeder held onto but decided not to show. These Wheatens deserve their own home. In reality, these are wonderful dogs and you don’t have to go through the rigors of potty training, lack of sleep, etc. The best source for information on all breeds of purebred dogs is the American Kennel Club website. Another outstanding resource for seeing a breed “up close and personal” is a dog show. You’ll find 150+ different AKC recognized breeds all in one spot along with their knowledgeable owners who are eager to give you honest information about their breed and, when asked first, willing to let you interact with a dog. Last, but not least, please take the time to learn more about all aspects of the Soft Coated Wheaten Terrier.